We opened a new restaurant bar in Naha, Okinawa. Squirrel monkeys can be seen in our bar. They live in a large, segmented space. 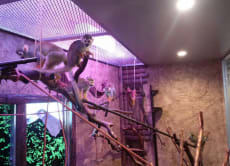 Guests can see and play with the monkeys. Of course, the bar space and the monkey's space are separated. At the restaurant bar, you can enjoy our original foods that are created with Japanese ingredients. Our floor staff is called the Monkey Girls. Their costume contains our bar's theme. They're very cute. Enjoy your Okinawa night with us!